When the UN Convention on the Rights of the Child (UNCRC) was unanimously approved by the UN General Assembly on November 20, 1989, it was widely heralded as a landmark in children's advocacy. However, many children's programs are still designed with little thought to religious or cultural diversity, even though the importance of culture was highlighted at the convention.Religious Dimensions of Child and Family Life examines the UN Convention on the Rights of the Child from the perspectives of eight of the world's most-practised religions -- Islam, Christianity, Hinduism, Buddhism, North American Native spiritual belief, Judaism, popular Chinese religious practice and Baha'i. The authors of each article pay special attention to religious moral codes of conduct governing parental behaviour, child-rearing norms and the role of children in spiritual practice. They pinpoint where positive support is provided, but also where the religions criticize or disagree with the ideas of the Convention. When considered in relation to the UN Convention, these ideas provoke a lively discussion. 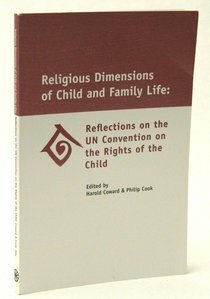 About "Religious Dimensions in Child and Family Life"